This entry was posted in Bad Law, Lawsplaining and tagged Affray, Ben Stokes, Courts, Cricket, Crime. Bookmark the permalink. Typo alert: the incident in question took place in 2017, not 2015. I’d hate the reader to think it took nearly three years for this matter to reach court! This, as usual, is so helpfully forensic. Clearly, bearing in mind that I wasn’t at the trial, I have to take the advice here that I should not comment. So I won’t, in the sense of sounding off about guilt, non-guilt or innocence. But since there is a Comments section, could I raise one issue, as well as noting one tiny error, which I’m sure most can work out but which does cause a double-take in such a superb bit of writing – the idea that changing or adding to a charge is “a not a common occurrence” (= not uncommon). 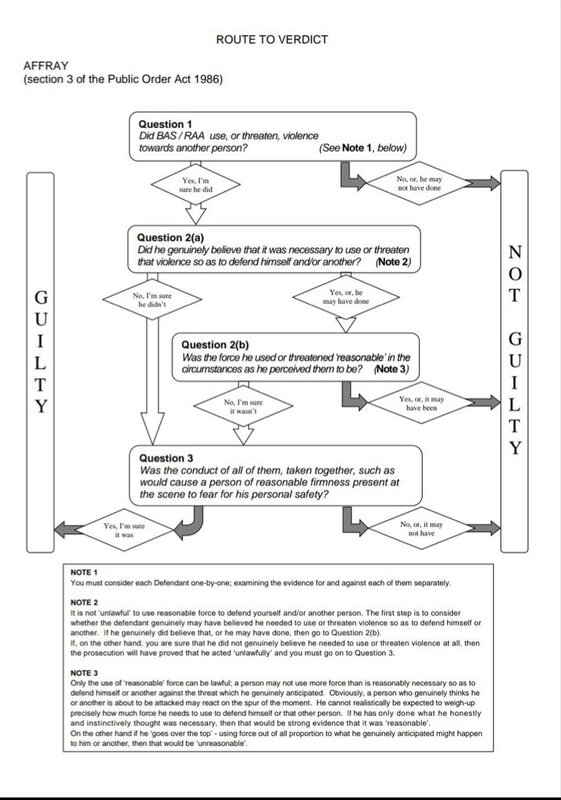 More seriously, I now understand so much better why the jury could clear BS, and the multiple escape routes on the flowchart to conviction. And here’s my question: surely, if one of the conditions of affray relates to fear on a reasonably firm me, surely that in itself would be the almost inevitable get-out, because one could imagine watching these guys thumping and kicking one another without fearing about being drawn in. Do I not recall other witnesses or opinions of people who vaguely stood and watched? And you say too that there doesn’t actually have to be such an observer – just an imagined one. I can certainly well appreciate why there would have been a late and urgent wish to add in the assault charge. Thank you for deconstructing all this, as I had been left rather shaking my head at what might best be described using your own words as “a pack of incoherent and inconsistent … statements”. It is frustrating when certain media outlets have shown unacceptable bias and suggested that ‘he’ was let off because of ‘who he is’. As you rightly point out, none of us were in court and didn’t hear the evidence in its entirety. I suspect that some self-appointed bar-room gossips will continue to deliver ‘their verdict’ with little or no knowledge of the law. As ever, you have provided the rest of us with a useful analysis of the law relevant to this case. Thank you! Who decided to send case to London CPS for charging instead of Bristol? Was Barry grabbing Ali’s groin prima facie a sexual assault? (This was important as Ali’s reaction to that could have given him the argument of self-defence and Stokes’ actions could have been due to misinterpretation of that event). If this is all kosher why are Avon &Somerset and CPS accusing each other for not charging Hales? I understand the ECB will now take some form of disciplinary action. Is it not wrong to put an individual through more than one legal process for the same offence? As has been said, there are several clear routes for the jury to find not guilty. The fact that Ben Stokes’ aggression appeared from the footage to be ‘decisive’ does not matter. The fact that Ryan Ali, one of the other two accused of affray, in a state of some intoxication by all accounts, was armed with a bottle which he raised as a weapon would surely have been enough for the jury to affirm that Stokes must be acting in self-defence in using his fists against the other two. It was the bottle that swung it, perhaps. A friend was mugged once. When he’d wrestled the knife off the robber, the robber then produced a second weapon. I suppose one lesson is that it’s wise to make sure that the bloke with the bottle can’t attack you with something else. Another possibility is that it’s wise to deal conclusively with the bottle chap before some of his pals turn up. Anyway (i) the jury heard the evidence, and (ii) the members of the jury might know far more about street crime than me. Good article. But it’s realistic rather than reasonable prospect of conviction. Excellent piece. Having attended and produced many files for Crown Courts, Coroner’s Courts and magistrates, unless you hear everything, you can’t be judgemental with any real justification. The part I still struggle with is the reasonableness of self defence. When an individual is backing away, with hands raised as if to say “enough”, how can it be reasonable self defence for the other party, Stokes in this case, to continue to pursue them, and continue throwing punches until the individual is knocked to the ground – that’s no longer defence, it’s aggression. Otherwise, thank you – an interesting and helpful read. I dare say you will have to remove this passing thought but my immediate response was to remember the acquittal of a rather well known footballer,also recorded,who seemed to go up and punch a DJ in the mouth without there seeming to be any threat of violence. How on earth do you get a jury to convict a sportsman who is advancing our National Pride? It’s always difficult to reach the “beyond reasonable doubt” stage when the eyewitnesses are mostly off their heads on drink etc, and especially if crowd psychology comes to bear. (Hence the concept of the “dangerous place” [pubs, clubs, rowdy town centres, trains full of football fans, etc) in offensive weapon and other crimes – which can escalate a sentence significantly. You sit there hearing a trial and having to make your decision on a set of accounts which often don’t seem to relate to the same incident. Having total consistence between witness accounts raises its own questions. Often you are left wondering why this or that apparently significant person hasn’t been called by either side, though of course you can’t factor this in to your decision. People who don’t spend time in trial courts tend to overestimate the value of CCTV . Yes it can sometimes confirm that punches were thrown, bottles brandished, etc – and this can be helpful if the defendant or complainant are adamant this didn’t happen. It is usually completely unhelpful, silent indeed, on the equally crucial stuff that may or may not have led up to the violence. In my experience on the bench this is often an important component in the reasonable doubt which leads to a defendant walking when you feel in your heart that he should probably be spending the next few months’ weekends collecting litter or removing chewing gum from the pavements. Affray is always a tricky matter, because of the imponderables [Are you a Person of Reasonable Firmness at 1am on a Sunday Morning?] and the matter of having to make one up if a PoRF is not apparent on the video. I wasn’t surprised BS walked free from court, and not just because it’s often hard to get a conviction with heroes and national treasures. I agree that CCTV is not definitive and can be misleading in a vacuum….but in relation to the BS and SG trials the CCTV appears to confirm assaults at a point when it would have been easy to walk away from violence which had subsided or never started. In relation to BS charges of ABH might have been more suitable but that decision was made by someone far more eminent than yours truly. Certainly what we were told when I was on a jury. Then we all breathed a sigh of relief and got to work. and the law should have faith in our capacity to understand that rather than infantilize us by dumbing matters down. I have no idea whether or not Ben Stokes is guilty or not, or and this is a quite different thing whether or not he should have been found guilty in the trial. What I can comment on is the impression given by this and many other trials in the media. The impression is that who you are has a very big impact on how justice is administered. At the bottom end a poor ill-educated man and at the top a wealthy, attractive and vulnerable looking female. Somewhere in this spectrum towards the top are popular sportsmen. This may not be a fair impression or it may be fair but mainly a consequence of human nature and better representation and presentation by the wealthy and well educated. I know consciously that there are many quite legitimate reasons why Ben Stokes may have been found not guilty but I have seen a video in which he punches someone and my immediate reaction is that if I acted in the same way I would be in jail. Everyone I have discussed it with made the same observation unprompted. This may be wrong but I am sure it is extremely widely believed and that is a problem. Any idea why Treasury Counsel would be consulted in a case such as this? It’s one law for celebs, another for plebs. “how can it be reasonable self defence for the other party, Stokes in this case, to continue to pursue them, and continue throwing punches until the individual is knocked to the ground?” For the reasons I mentioned above.